The former U.S. President and his Vice President are at complete odds with one another. The issue? Al Gore’s assertion of rampant global wine point score inflation. Bill Clinton, now California’s Wine Czar, says his former Vice President is totally off the mark on this one. “You know I love Al dearly and have the utmost respect for him but on this one he’s just plain wrong,” stated Clinton as he sat behind his desk in the Capitol building in Sacramento. “There’s nothing to do,” retorted Clinton. 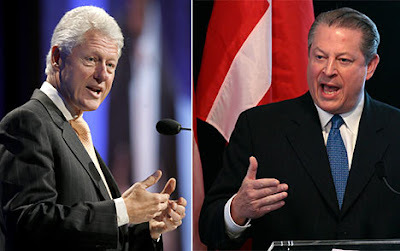 When Clinton was informed of Gore’s snippy remarks, he shook his head. “Al, Al, I covered for you for eight years but that’s because I didn’t want the American people to get alarmed. The guy thinks he invented the internet. Do I need to say more?” Clinton leaned back in his chair and twirled his finger around while pointing to the side of his head. On a more serious note, bloggers can participate in a survey that is gathering research for an article on wine blogging. Click here. I found out about this from a post on the Dover Canyon blog, by way of Wine Life Today. Check out Dover Canyon's blog for more info.